Are you thinking about a relaxing holiday? To regenerate your body and mind, choose to spend your holidays in a villa on a hill in a panoramic position. You can admire the view throughout the day and see how the green hills of Tuscany, outlined by cypress trees, change with the light of the sun and in the evening, perhaps tasting a glass of good wine. CASETTA I CILIEGI, Stone farmhouse sleeping 5 with private swimming pool and Wi-Fi connection. Panoramic and quiet, ideal for nature lovers. Garden completely fenced. Cortona 15 km. INFINITO, Villa for 16 people with private swimming pool and Wi-Fi connection, amazing panoramic position, near Sinalunga. Large outdoor area with terrace equipped with views. VILLA CASAVECCHIA, very panoramic villa with private swimming pool completely fenced for 20 people between Arezzo and Florence. Pets allowed and Wi-Fi available. The village of San Giustino Valdarno is 7 km away. CA DI VESTRO, Villa with private swimming pool for 10 people. Extremely panoramic position. Pets allowed and Wi-Fi included in the price. IL BASSO, Stone villa for 8 people with private garden and swimming pool. Excellent value for money. In an extremely panoramic position in the Casentino Valley, 5 km from Talla. LA ROGAIA, Villa for 9 people with private fenced pool, situated in a panoramic and secluded position. Free Wi-Fi. Pets allowed. A few km from the city of Arezzo. PALAZZOLO ALTO, Villa for 10 people with private pool and panoramic view, near the village of Monte San Savino. Ideal starting point to visit Tuscany. Wi-Fi Internet connection. 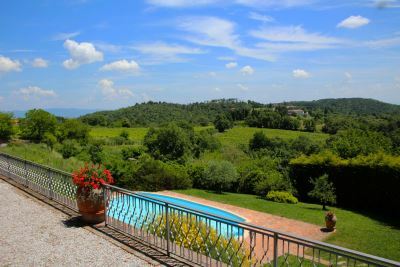 CASALE AIACCIA, Panoramic villa for 8 people 5 km from Arezzo. Fenced swimming pool, Wi-Fi connection, foosball table and large outdoor area.